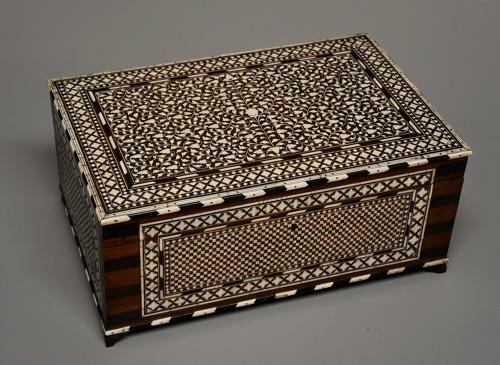 This box consists of a highly decorative hinged lid with a central section of inlaid ivory scrolling foliate decoration framed by a border of ebony and ivory chevron stringing leading out to further borders of inlaid ivory quatrefoil and geometric decoration. This leads down to the front, sides and back, these being profusely inlaid with ivory geometric designs with ebony & ivory chevron border to the top and bottom with brass bound decoration to all four corners and the box is supported on bracket feet. The interior reveals the inside of the lid consisting of a central mirror framed with inlaid ivory designs and ebony & ivory chevron decoration with an open section to either side inlaid with a foliate design. The main box area has an open compartment with a removable central tray revealing further open compartments, the box has a tambour sliding shutter to the back which opens to reveal another compartment. The Hoshiarpur region of India produces many items using shisham wood as this was indigenous to the area, the area was renowned for making high quality ivory inlaid items and pieces were shown at various local exhibitions in the late 19th century. Many items were exported to Bombay & Calcutta and increasingly to London, England and records from the early 20th century state that ship loads of such items were exported to both Europe & America. The people of the Hoshiarpur district presented a similar inlaid box to Queen Victoria in 1887 to celebrate her Golden Jubilee and this can be seen at the V&A in London where it has been on loan from the Royal Collection since 1924. This box is in excellent condition for age, is of stable construction and can go straight into a collection or home - it could be used for many purposes such as a sewing box, jewellery box etc.